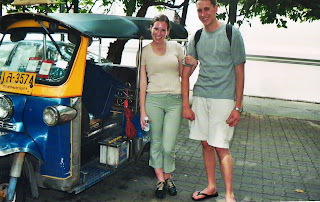 'Put, put, tuk, tuk , vroom'…the tuk-tuk, an auto rickshaw that carries my husband and I through the crowded, chaotic streets of Bangkok fumes a black exhaust that covers my sweaty, sunburned skin with a layer of the infamous city smog. 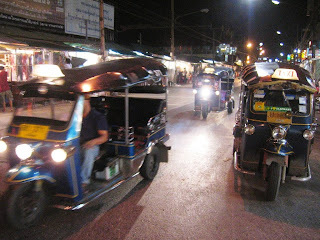 We hailed this tuk-tuk outside our hotel and have asked the driver to take us to the Blue Elephant for dinner. I’m starving and after our day of sightseeing the exotic metropolis I desperately crave a relaxing, satisfying Thai meal. We ride in the tuk-tuk for what seems like ages. We dodge fruit vendors, bypass slower traffic, and nearly curb the makeshift median a few times. Suddenly the tuk-tuk pulls over at a store front and the Thai driver, who doesn’t speak a lick of English ushers us into a shop. He welcomes us and encourages us to shop through the conglomeration of touristy items, mostly Buddha figurines, ‘real’ Thai silk, and home wares made from teak wood. We’re not really in the market for souvenirs. After a long day we just want to eat dinner. We leave the shop and hop back in to the tuk-tuk onward to our desired destination, so we think. The driver stops at another shop and requests that we at least have a look. I understand these guys are dirt poor and that the driver gets a commission from every purchase made at each shop. It is collaboration and I can’t blame them for that. We have a browse at the junk to appease the driver and request we proceed to the restaurant where we have a reservation that we are now late for. 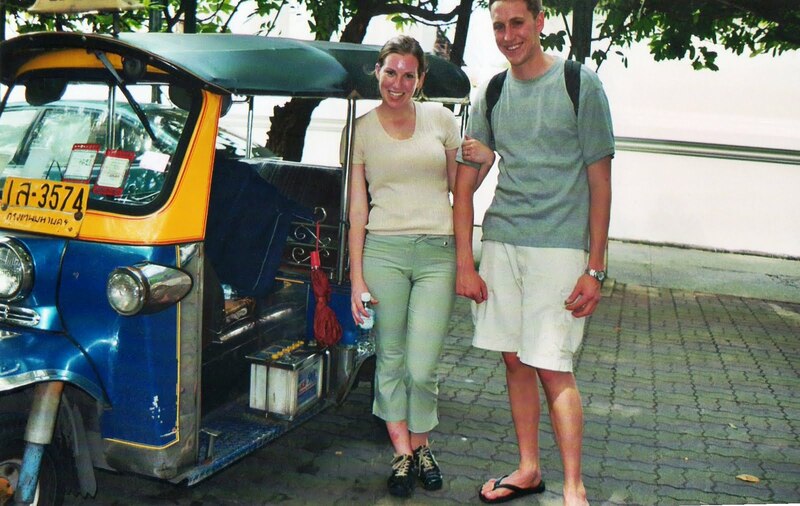 Though the tuk-tuks are a cheap method of transportation, (usually around 30B for a short trip) you are bound to tour all the souvenir shops on the way to your requested destination. If you choose to take a tuk-tuk sweetly but firmly request that you go directly to your destination. Haggle at least 15B off the quoted fare as the price is inflated from the start. Bangkok is meteorologically the world’s hottest city. Paired with a population of 9,100,000 and traffic that persists all hours of the day, expect sticky, gritty, smoggy air that can be especially apparent in tuk-tuks. Avoid taking tuk-tuks (or taxis for that matter) between the hours of 7:00am – 9am and 4pm – 5pm. These times are ‘rush hour’ and you don’t want to be stuck in traffic for hours sweating and breathing the hazardous fumes from engines all around you. Taxis are also plentiful in Bangkok and can be flagged all about the city. They come in a variety of colours though green-yellow and red-blue ones are the most common. They are very cheap by international standards (35B flag rate and 5B/km after that) and the drivers have an encyclopedic knowledge of the city. The Skytrain (BTS) and the underground rail system (MRT) are great public transportation alternatives to tuk-tuks and taxis. The BTS is cheap, smooth, cool, clean, fast and scenic way to enjoy Bangkok. Trains service two lines and arrive every 3 - 6 minutes or so between 6:30am and midnight. MRT is also a clean, cool choice for public transport. With a capacity to whiz 40,000 passengers per hour in each direction, trains arrive every five minutes in peak times (7am - 9am, 4pm - 5pm) and every seven minutes off peak. My blog (onetravel.wordpress.com) receives about 1000 visitors a day and that number is steadily growing.